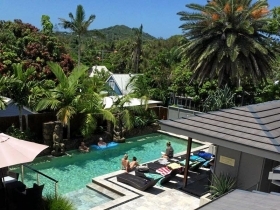 Aabis at Byron in Byron Bay has been awarded Australia’s largest people’s choice award for the North Coast Region for 2018. The Hotels Combined Recognition of Excellence Awards are presented to hotels in local regions based on outstanding customer satisfaction as rated by travellers. The awards announce one local hotel winner in each of 62 Australian regions and 29 New Zealand regions during their peak visitor periods once a year. Aabi’s at Byron came out on top for ratings, reviews and positive customer feedback in the North Coast region. The guesthouse is a luxury, 4.5 star facility, with “adults-only exclusivity”. Finalists and winners are representative of the highest standards in the industry, averaging 9.7 out of a possible 10 points, compared to the industry standard of 7.2, placing them within the top three per cent of hotels worldwide.